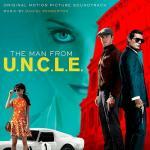 A total of 18 songs, this soundtrack was created for the quite active film in espionage style. Entertaining blockbuster has different music in its accompanied – Latin American (eg, Jimmy, Renda se by Tom Zé and Valdez), in the style of the movie "Puss in Boots" and a spy-style "James Bond" (as You Work for Me by Laura Mvula ). The film is quite promptly came out – it reflects the confrontation of Russian and Americans. In fact, one of the eternal themes. Beautiful actresses, beautiful actors, all is beautiful – the environment, the atmosphere and the music soundtrack. Broaching and beautiful melodies, such as the Il Colpo by Ennio Morricone, will satisfy lovers of melodies consisting of sounds, escalate the situation.